EDITED: A million things happened at once this past week, and I’m leaving for DC tomorrow to attend a workshop on open government in libraries. Since I’m not going to have time to compile all the great submissions I’ve already received, I’m giving the rest of you slackers an extension. Let’s run this baby till Friday, May 9th. Same rules apply. Good luck! Let’s talk about design, folks. Between the maker movement, the ease of online publishing (in any form, from Twitter on up), and the push to learn code, there’s a clear theme: We are in control. More and more of the moving parts underneath our technology have been exposed. If we have the skills, we can use this level of control to rewire circuits, unclog pipes, and create better experiences for all of our patrons. I’ve been working to encourage more design thinking at my new library, it has occurred to me that I’m going about this process backwards. We can teach as many skills as we like. But if people can’t start articulating what it is they actually want out of their library services, we’ll never get any of this stuff off the ground. Deep down in its painstakingly carved little heart, design is about knowing what to ask for, and spelling those desires in as specific a manner as possible. To this end, I’d like to start a semi-regular exercise. Let’s call it The Librarian Design Challenge. Here’s how it’ll work: For each challenge, I’ll introduce a hypothetical design problem, using something that’s fairly common to most libraries. Anyone who wishes to participate can do so, using any tools they like. This could be as elaborate as creating a working prototype on your own webspace, or as simple as a sketch on the back of a napkin. Once you’ve finished, you can post it to your own webspace and send an email to toby at theanalogdivide dot com. I’ll compile the submissions, and we’ll spend some time unpacking what makes each one unique. It’ll be a little bit Layer Tennis, and a little bit of the MacGyver Challenge. I’m hoping this exercise will give we librarians a better sense of what truly makes a service useful or frustrating. As we get the hang of this, we can do even more to make all our spaces – virtual or otherwise – even better. Your first challenge? Create a online library card signup. You could say that signing up for a library card is our equivalent of what websites refer to as onboarding – the process with which a user becomes part of that site. Sites invest significant work-hours and enormous sums of money to make this process as appealing as possible? Libraries? Not so much. Whether through requiring in-person visits, confusing policy, or resorting to PDFs, libraries tend to get in their own way when it comes to attracting new users. We can do better than this. I’d like to use this inaugural Challenge to prove it. Design a workflow that a hypothetical user would use to sign up for your hypothetical library. You’ll need to use this design to address the issue of proving residency. If there’s a policy that needs to be set in order to make your design work, you’ll need to explain that policy. Any medium is OK. Pencil-and-paper. Google Form. Flowchart. Photoshop mockup. Working prototype. If you draw inspiration from somewhere, cite your sources. I’d love to hear a bit about your process. You must have your design published by Monday, May 5th Friday, May 9th. Remember to email me (toby at theanalogdivide dot com) with the link. If you don’t have your own web space, feel free to send me the design and I’ll publish it here. Ready, designers? (If you’re reading this, you are a designer.) Get designing. This past Wednesday I had the unique privilege of doing a talk with Richard Kong and Leah White at the Small Public Library Management Institute down in Springfield. SPLMI (it’s a library event, so it’s gotta have an acronym, innit? ), is an weeklong program put on by the Illinois State Library just for managers and directors of small public libraries. It’s intense. It’s fairly comprehensive. And it’s only $50 bucks for the participants. As you can imagine, it’s a pretty amazing thing that the ISL puts on, and we were honored to be invited to speak. And, as you might expect with such an energetic, inquisitive group, we had a ton of questions and ran out of time. To make sure the group gets their money’s worth, the three of us have agreed to blog the remaining sections that we didn’t get to cover. This allows us to impart some implied knowledge, as a) it’s a reminder to all the SPLMItes that we’re eager to continue the conversation, and b) it reinforces the need for library technologists to be little magpies, picking and choosing the very best tidbits from a variety of sources. My deleted scene for this talk is all about digital literacy. I’ve written another piece on this topic in the January/February issue of Public Libraries, so if you want a more linear piece of writing on the subject, you might want to start there. If you’d like to follow along in the slides, you can start at slide 147. This is why it’s called The Beast. ALA’s task force defines digital literacy as “the ability to use information and communication technologies to find, understand, evaluate, create, and communicate digital information, an ability that requires both cognitive and technical skills.” In other words, it’s not only the ability to research, identify, and extract meaning from all types of media, but also the skills to create meaning using those same tools. Just what those skills are can vary just as widely – from advanced video editing all the way to basic mouse skills. People can be at multiple points on the digital literacy spectrum at the same time. People with strong critical thinking skills don’t always have a good handle on digital tools, and digital natives aren’t automatically experts at interpreting information or doing basic research. Libraries are the only organization that’s truly open to all of these types of people. This isn’t just an opportunity for us – it’s a responsibility. There are a few libraries that are really taking the lead on this. Arlington Heights Memorial Library (Richard’s stomping grounds) offers 5 different classes of technology instruction: Computers 101 (mouse, email, Internet); Working Life (Office-type tools); Digital Life (social media, gadgets, other web tools); Creative Life (digital media production tools); and Informed Life (research tools and other types of bibliographic instruction). Each of these tracks together adds up to a fairly comprehensive body of digitla literacy tools. Most library staff members are likely to be at different points on the spectrum. This is a chance to really flatten the learning model, and learn new techniques side-by-side with the community. If you feel like you’re unclear on a particular concept, try to recruit a volunteer from among your patrons. Not only is it great community outreach, but it helps you to demonstrate a side of the library they may not yet be familiar with. You should also think of this in your hiring practices. My library looks to recent graduates from graphic design and video production programs when filling its ranks of computer lab assistants. It’s a sort of mutually beneficial exploitation – we get trainers and abilities that we wouldn’t normally be able to obtain from the librarian ranks, and they get a steady paycheck and a chance to pad out their portfolio while they look for something in their chosen field. Lots of schools also have a service requirement that can be a great place to recruit talent. I did a job shadow with a couple of kids interested in IT, and they had no idea the library was doing as much as it was. It’s a real chace to win over some new hearts and minds. A few government organizations are starting to put some serious weight behind providing resources for digital access and literacy instruciton. Connect2Compete is an initiative of the FCC Digital Literacy Corps, designed to link end-users in need with discounted or subsidized hardware and/or broadband access. It’s also a clearinghouse for local organizations that offer technology training. Take a look at their Training Locator -your library may already be listed here. EveryoneOn is another repository for digital literacy training. It’s a bit of a catch-all – there are resources from a variety of different websites, reminiscent of the old website directories we used to work so hard to compile in our own libraries. As a result, it sends users to a variety of different sites, each with its own interface and learning curve. This is less than optimal if you’re helping someone with a more basic level of online skills. This is where we come in. DigitalLearn.org is a pilot project launched by PLA, with grant funding from IMLS. Rather than sending people to multiple sources, the site will be a source of uniformly designed modules, giving end-users simple step-by-step directions for understanding the digital tools at their disposal. There’s also some badge-type incentives to keep people motivated in their learning process. DigitalLearn.org also has a back-end for trainers and digital literacy practicioners, geared to create a community of practice for us to share best practices and useful links. The site is currently in beta, with plans for a full launch at ALA this summer. Like just about every type of instruction we offer, digital literacy training is only going to work if patrons find the right context to fit the skills into their own life. We’re going to have to work with our patrons to identify what their goals are, and how we can build teaching tools around digital tools. When you’re done here, go visit Richard’s and Leah’s posts. We’ll get a little blog ring going, and hopefully start some interesting conversations. Whether you’re a SPLMI participant, or just someone who stumbled on this page, I look forward to hearing your thoughts on digital instruction in small libraries. 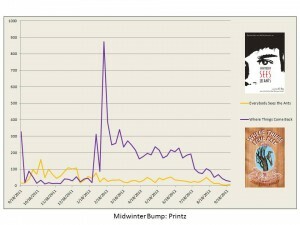 For those unfamiliar with the Midwinter Bump, I thought I’d post a more thorough explanation of what this crazy project is all about. Essentially, I’m looking to quantify the ways librarian efforts contribute to book sales. What I need: I need a co-conspirator from each awards committee. In order to conspire properly, I’ll need you to provide two titles. 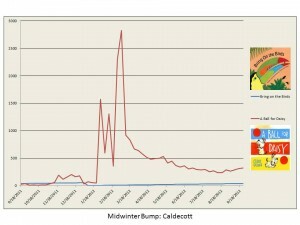 To demonstrate the impact of an Awards bump, I’d like to take a similar title and compare the sales going forward. Ideally, this title is fairly “close” to the winner – similar appeal factors, sales figures, and price points. 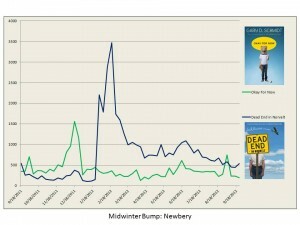 Of course, this is only one part of the picture, and doesn’t do much to quantify the day-to-day effect of librarians handselling one particular book over another. But it provides us with a useful tool (along with things like Library Journal’s Patron Profiles) to help us advocate for the role libraries play in the bookselling ecosystem.